It’s a fundamental principle: a Tour that starts in Brittany finishes with the crowning of a cycling giant. Look at the evidence: Brest 1952: 1st Coppi; Rennes 1964: 1st Anquetil; Brest 1974: 1st Merckx; Plumelec 1985: 1st Hinault; Saint-Brieuc 1995: 1st Indurain! Five stars on a flawless prize list. Coppi, Anquetil, Merckx, Hinault, Indurain: five cycling legends who, in turn on the Tour, garnered the force in Brittany to clinch an ultimate triumph in this prized race three weeks later. Is this not the stuff of tales and legends, a tribute to the doyen of cycling races from its greatest riders? A start from Brittany is also the guarantee of a grand and magnificent celebration, a passion shared by an entire Region gathered together in the wake of its president, Jean-Yves Le Drian, responsible for the project. 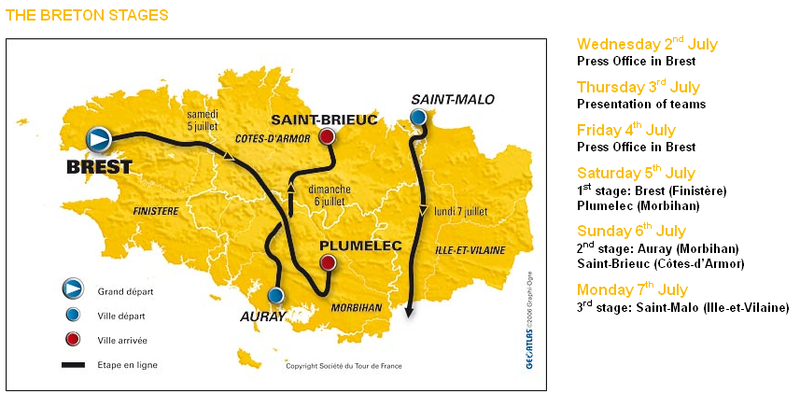 One region, four counties, five towns – together – make the recurrent dream of the Tour reality. From the Finistère to the Ile-et-Vilaine, from the Morbihan to the Côtes-d’Armor, in Brest, Plumelec, Auray, Saint-Brieuc, Saint-Malo, and in all of the towns travelled through, Brittany will present us with its most beautiful landscapes, its crowds clustered along the five hundred kilometres of road covered, its love of cycling. For 2008: In the land of Bobet and Hinault the Tour de France is at home. Brittany wanted the Tour. The Tour wanted Brittany.